JOHN RUTTER (1945): Three American Miniatures for flute and clarinet). MALCOLM ARNOLD (1921): Divertimento for flute, oboe and clarinet, op. 37. THOMAS CHRISTIAN DAVID (1925): Sonata. DAVID LIPTAK (1949): Duo for flute and clarinet. NORMAN C. DIETZ (1919): "Dialog" (flute and bass clarinet). WALTER PISTON (1894-1976): Three Pieces for flute, clarinet and bassoon. 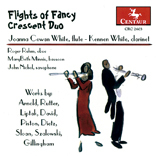 DONALD SLOAN (1956): Five Flights of Fancy for flute and clarinet. ANTONI SZALOWSKI (1907-1973): Duo for flute and clarinet. DAVID R. GILLINGHAM (1947): American Counterpoint for flute, clarinet and alto saxophone.